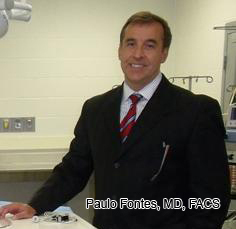 Regenerative Medicine Today welcomes Dr. Paulo Fontes. Dr. Fontes is a transplant surgeon, a scientist, and an entrepreneur. He is an Associate Professor of Surgery at the University of Pittsburgh Medical Center and a Deputy Director, McGowan Institute of Regenerative Medicine. He is also the Director of the Machine Perfusion Program, a collaborative effort between the Thomas E. Starzl Transplantation Institute (STI), Department of Surgery, and the McGowan Institute. Dr. Fontes discusses his research in organ perfusion. For more information about Dr. Fontes, click here.